Elliott Thompson was once a historian with a promising academic future, but his involvement in a scandal meant a lost job, public shame, and a ruined love life. He took shelter in his rural California hometown, where he teaches online classes, hoards books, and despairs of his future. Simon Odisho has lost a job as well—to a bullet that sidelined his career in law enforcement. While his shattered knee recovers, he rethinks his job prospects and searches for the courage to come out to his close-knit but conservative extended family. In an attempt to manage his overflowing book collection, Elliott builds a miniature neighborhood library in his front yard. The project puts him in touch with his neighbors—for better and worse—and introduces him to handsome, charming Simon. While romance blooms quickly between them, Elliott’s not willing to live in the closet, and his best career prospects might take him far away. His books have plenty to tell him about history, but they give him no clues about a future with Simon. This book was a difficult one for me to get into. It went super slow, there was no angst or drama, and I couldn't connect with Elliott or Simon. The blurb was what got my attention, but the story couldn't hold it. I loved the little library Elliott built in his front year; we actually have something similar here but with winter coats, people drop off used coats and then if someone needs one they come and get it. I found myself skimming and just wishing for the book to end. I am sure others will love this slow, sweet story, it just wasn't for me. I recently discovered Kim Fielding’s writing thanks to Audible’s Romance Package, which then caused me to buy and devour several of her titles during one of their recent sales. As such, I decided to give The Little Library a read. 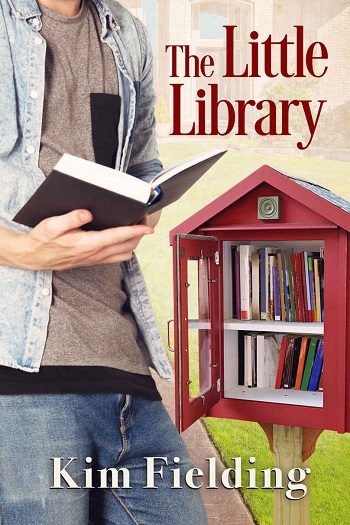 Not only do I adore the idea of little libraries, but the blurb turned me into a nosy Nelly – I just had to know what the scandal was that had ruined Elliott Thompson’s life. Regarding the scandal, I found the Skype interview to be unnecessarily cruel because at least one of the interviewers knew Elliott would never be hired because of the info they had gleaned about the scandal, yet they seemed to have seized upon the opportunity to dangle the teaching position just so they could obtain more gossip. Disgusting. As for the rest of the book, The Little Library is rather slow to start. I believe I was about 20% in before anything really seemed to happen. This is largely due to the fact that Elliott is an introvert who works from home, so his interactions with others are very limited until Simon trudges his way into Elliott’s life, thanks to the little library. The combination of Elliott’s ex being an opportunistic parasite and Simon’s self-consciousness over his injury and still being in the closet means that their relationship develops very slowly. For me, this wasn’t an issue because I felt like I got to know both men better as they spent time together and learned about each other and themselves. I liked how his relationship with Simon and how his interactions with some of the little library’s patrons brought Elliott out of his shell, giving him the chance to become more involved with his community and to see that the scandal that sent him running to California didn’t have to ruin his life. In the same vein, I liked how spending time with Elliott and learning more about himself gave Simon the courage to come out to his parents – even if it did go badly. But the major drama in the story was a perfect storm of events that led to Elliott’s meltdown. I cannot even imagine how I would have responded had I been in Elliott’s shoes, which is why I was so grateful that Simon was there to have his back. While I did feel like the end may have wrapped up a little too neatly, I think that’s because the passage of two months was easy to miss if you weren’t paying attention (translation: I had to go back and reread the epilogue to catch it). Neat or not, I loved the ending and think it was perfect for Elliott and Simon, and I would happily read a sequel. One of the themes that I think Fielding addresses so well in The Little Library is that of irrationally directed anger – and no, I’m not referring to Elliott’s blow-up at his neighbor because that incident would have tested the patience of a saint. Elliott and Simon each encounter something within the bounds of their fledgling relationship that hurts or frustrates them and then makes them angry at the other, even though that person is not at fault. I think most people have encountered a similar situation in which something happens, and they direct their anger at a target who is not actually responsible for the situation, which then makes them angrier because they know they shouldn’t be angry at that person. What makes the anger irrational is that it’s directed at someone who we know isn’t responsible, yet we cannot seem to not lash out at the person. Fortunately for them, Elliott and Simon managed to reign their anger in before they said anything that couldn’t be taken back and then took a mature route of stepping back to cool down and get their head on straight before addressing the issue. Were feelings hurt? Yes, but not in a way that couldn’t be fixed. Their knee jerk reaction may have been human nature, but they both managed to respond in a mature fashion before they burned bridges or broke hearts. Here’s hoping that I can remember Elliott and Simon’s course of action the next time I get angry and try to take it out on the wrong person. I must say that as much as I came to love Elliott and Simon, Ishtar was my favorite part of the book. You’re gonna love Ishtar. Reviewers on the Wicked Reads Review Team were provided a free copy of The Little Library by Kim Fielding to read and review.